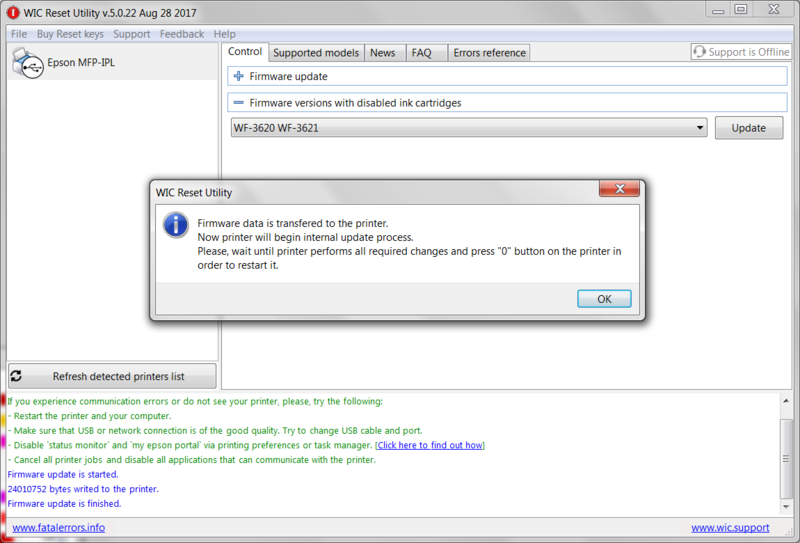 New WIC Reset Utility has availability for some printer models to make them Chipless. Printer will show 100% ink level all time you use it. You can get out ink cartridges or just IC Chips and printer will print as usual. Once You change printers firmware to Chipless Firmware - the printer will not need to reset ink cartridges, printer will not need to use Auto Reset Chips or CISS Chips - no one type of ink cartridges chips will be required anymore! 1. 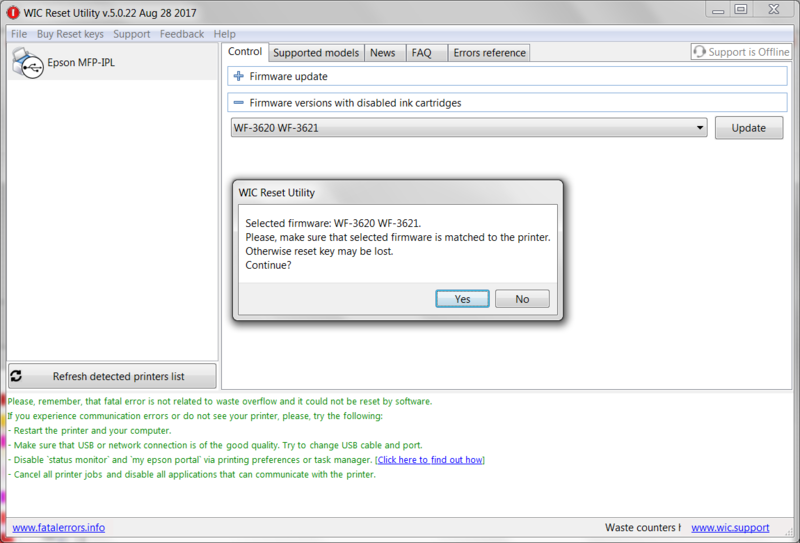 Latest WIC Version utility. 3. Windows OS or MAC OS computers. 1. Connect the printer by USB cable to your PC and run WIC utility. Disconnect all other printers from Your PC. 2. 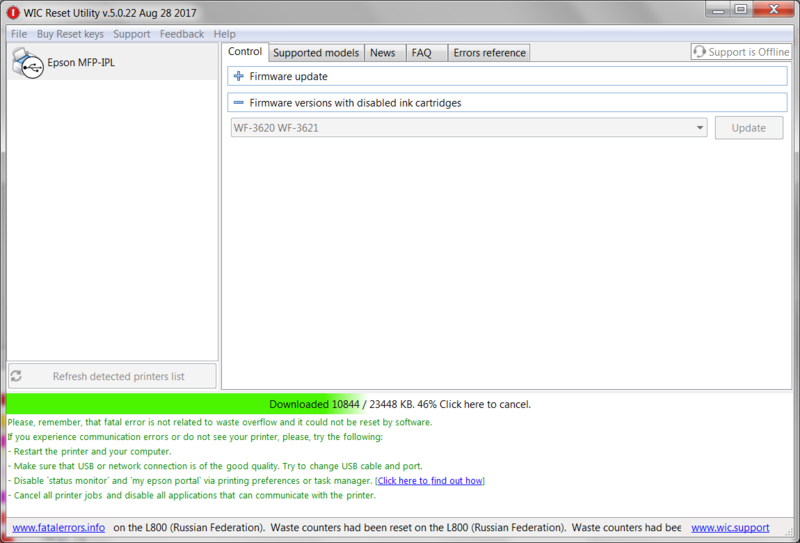 Click on Change Firmware Version button. 3. 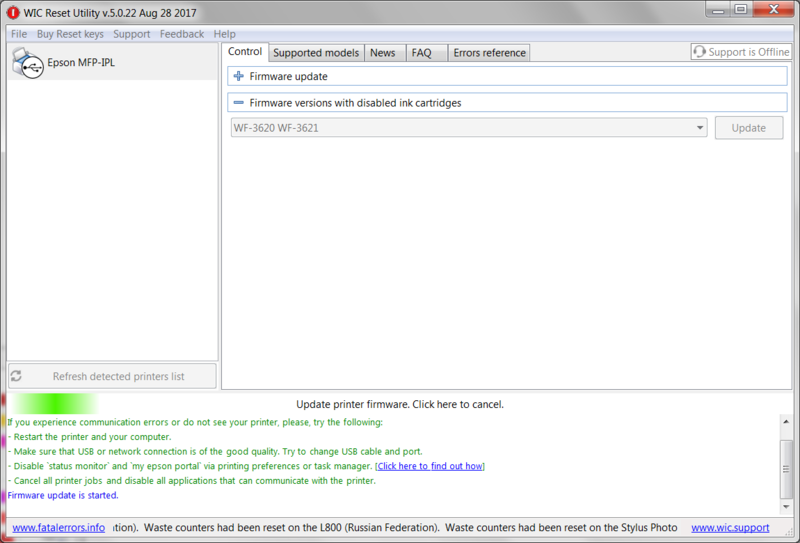 Put printer in Firmware Update Mode by folowing instructions for this printer model. 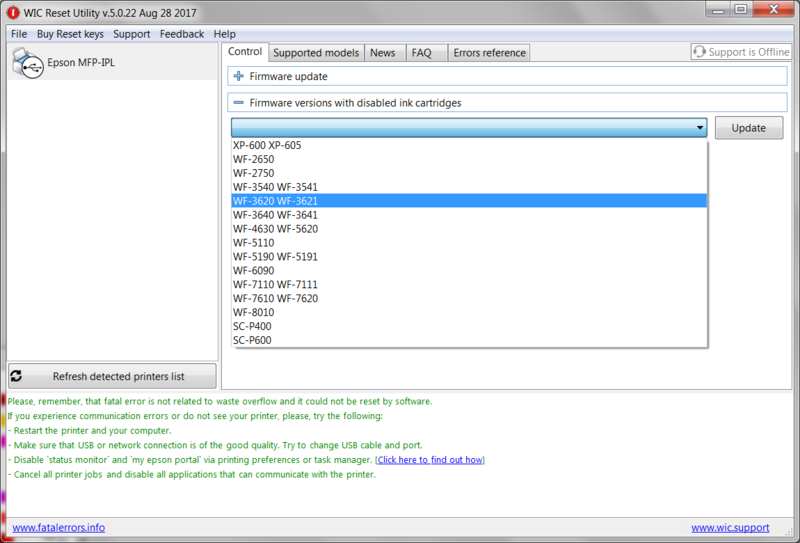 After You put printer in Firmware Update Mode it will indicatede like MFP-IPL - please pay attention on it. 4. 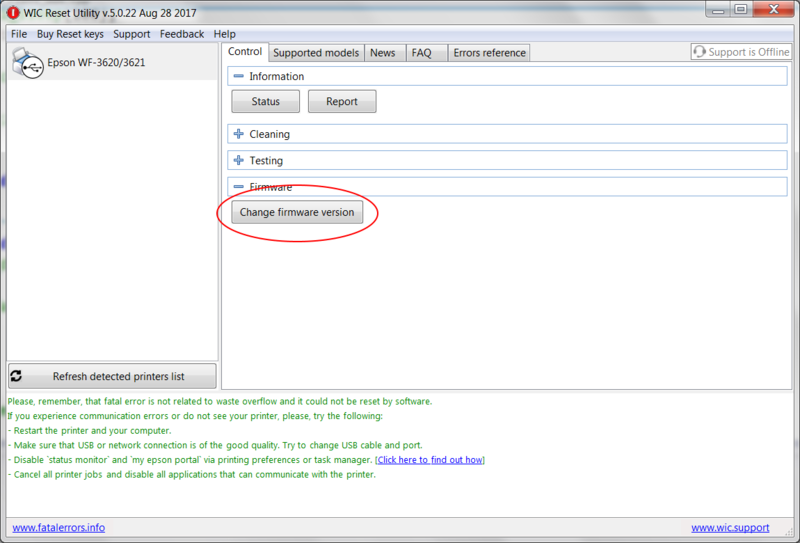 After that You have to open Firmware Versions with Disabled ink Cartridges drop list and select printer model you have connected. 5. Enter Firmware Key and press OK.
6. Wait untill confirmation message appear. 7. Switch OFF the printer and switch ON again. That's all. Now Your printer will not require any ink cartridges. Thus You can use Ink cartridges, Refillable Cartridges, CISS or other cartridges You want. Printer will never stop because of "ink finished" error or "not original inks" error. Please cantact us by Live Help or here in this thread. Have firmware IC disable for: XP 241, 231, 441, 431?? I am also interested in the chipless epson for xp 231 241 441. If you have it, please tell me where I can buy it? 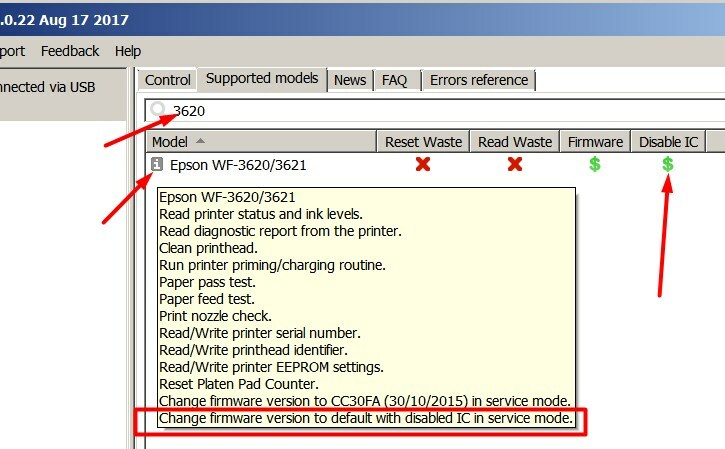 @John_Admin One question, i have wf-7610, but the chipless fw version is "default", please define default?, Is the first firmware from epson?, because older firmware haves bugs on fax & scan features. After chipless update can i update normally printer to latest? 19$ is expensive for an old firmware, better with arc chips. 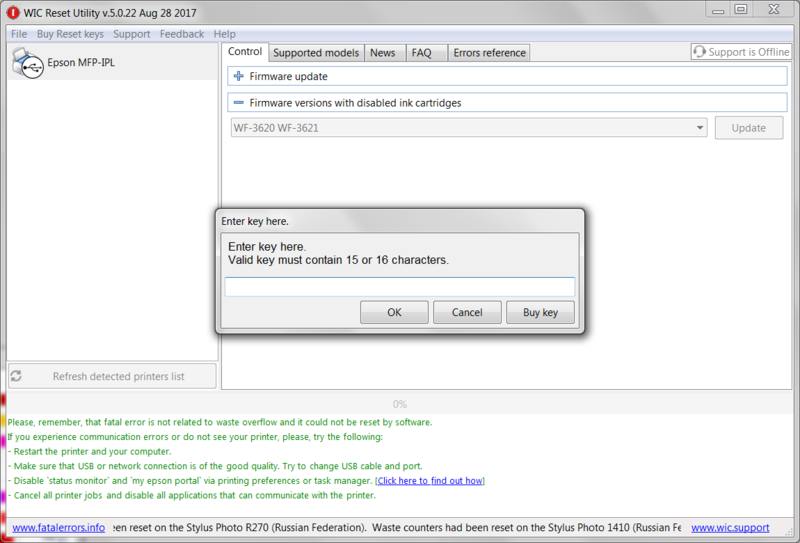 Can I reuse the same firmware key on same machine 2 times?? for example upgrade to chipless > upgrade latest > reupgrade to chipless? @John Is WF-2650 firmware the same for WF-2651? I cannot see WD-2651 chipless during the firmware update. i would like to know if this work for this models Epson WF-2630 Epson XP-446 Epson XP-340? if it has F13H6 firmware inside. Help - I can't downgrade Firmwareusing WIC. Older firmware working, but I can't change it anyway. I lost money, 4 WIC keys, without results. What firmware version is it based on, and do I loose other funcionality with this special firware? i want to downgrade firmware (chipless) on xp55 with Firmware code. I have a wf-7610, but the chipless fw version is "default", please define default? Is the first firmware from epson? or what version? cuanto tiempo dura la licencia desde que se compra? en caso de no usarla hay devolucion??? when I run EPFWUPD.EXE, I have a completion (finished) message and press "0". The printer turns off Is it compatible with your firmware? I have a ROM NOT WRITABLE MODE ERROR. Now Recovery Mode screen in the printer. I need HELP. caballitas, What is your printer model? Do you have QQ or email contact information in China? Who knows if wf-7120 will be supported by chipless solutions because I need to import ciss for this printer and don't know if I purchase them with chips or no?! 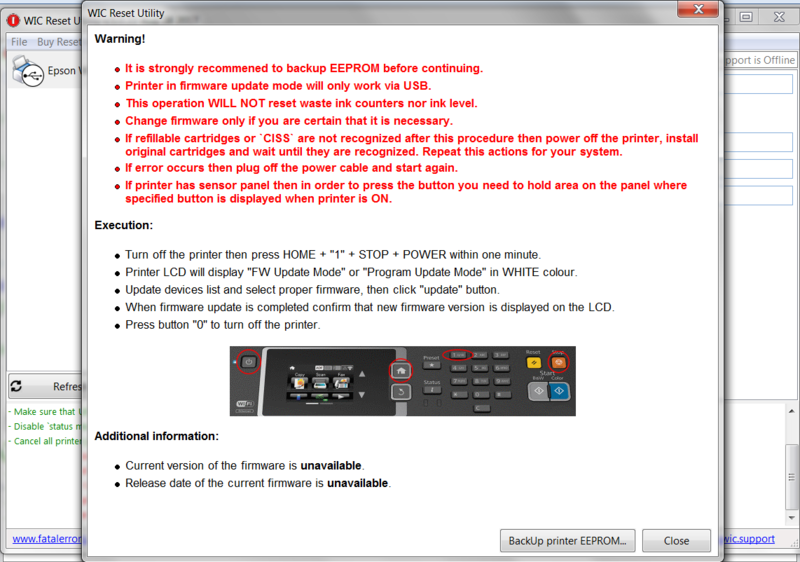 Please help me, tutorial detail downgrade firmware IC disable epson P607?